@rebel.dnc.staffer: Have you noticed a decline in interest and activity in LGBT rights advocacy since the Supreme Court granted marriage equality? Like now that the big fight is over there are just a few loose ends to tie up. Since 2013, we have seen the introduction of over 250 bills in state legislatures to limit protections for LGBT people. Of those, 20 have become law, including the infamous HB 2 in North Carolina. At the federal-level, we saw the introduction of the very discriminatory “First Amendment Defense Act.” Unfortunately, there is much more than a “few loose ends” that remain. Currently, LGBT people have almost no explicit protection against discrimination under federal law. @stephiphopoulos: How exactly is FADA discriminatory when it deals specifically with disputes between an individual and the federal government and not person to person relations. Certainly a competent lawyer should see the difference. FADA would permit sweeping, taxpayer-funded discrimination against LGBT people. As one example, it would allow any privately-held business to discriminate by refusing to let a gay or lesbian employee care for their sick spouse, in violation of family medical leave laws. @dana.hunter: If you could wave a magic wand to pass one bill currently in Congress what would it be and why? The Equality Act -- HR3185 & S1858 -- LGBT people, like all Americans, deserve clear and explicit protection from discrimination under federal law. @tribal.crane: Do you have any legislative goals for the remainder of 2016 that you are allowed to share with us? The ACLU has a wide range of legislative goals. 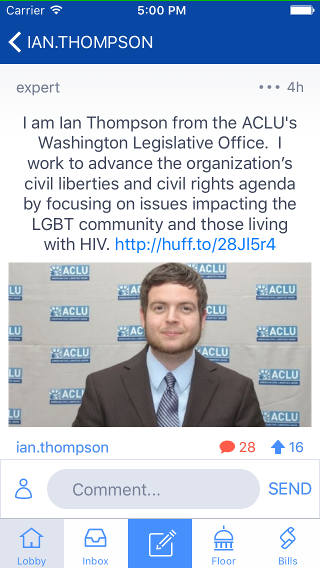 Related to LGBT rights, we want to see bipartisan support for LGBT nondiscrimination protections continue to grow. We also want to see efforts to discriminate under the guise of religious liberty (e.g. section 1094 in the House-passed NDAA) be rejected. @horsey.wofford: Last week I proposed taking action to enable gay men to donate blood. My proposal was met with a lot of aggression from congressional democrats. Why are so many liberals opposed to affording gay men the same right to donate blood to those in need as straight people? The ACLU agrees that the current one-year blood donation deferral for all sexually active gay and bisexual men is stigmatizing, outdated, and not supported by science. @horsey.wofford: I'm glad you agree. When I brought this up many liberals attacked me over the science of the issue saying that gay blood was too risky. Any reports out there to reject their claims? What would you propose to get the ball rolling again on loosening blood donation rules for gay men? FiveThirtyEight recently looked at the science behind this issue. Their post is available at – http://fivethirtyeight.com/features/to-keep-the-blood-supply-safe-screening-blood-is-more-important-than-banning-donors/ The pressure point on this issue is the FDA. @ian.thompson: Thanks for all the questions, everyone. I appreciate the back-and-forth. I'll be sure to check-in later this afternoon for any additional questions.